Located in Spartanburg School District 5 provides the option of resale or new construction. Established in 2005, home prices for resale range in price from $100K to &175K, while new construction starts at $175K and increases to $215K. Regardless of the age, enjoy this small neighborhood of about 100 homes on quiet cul-de-sac streets. Some lots are still available! Homes are a mixture of ranch and two story style homes constructed of either all vinyl, or a blend of brick and vinyl, while new construction homes are Craftsman style. Lot sizes in Bright Farms range from a ½ acre to 1 ½ acres. An annual HOA fee of $150 includes street lights and common area maintenance. Enjoy living in this 100% USDA eligible area where students attend Duncan Elementary, Beech Springs, DR Hill and Byrnes High School. Located less than 5 minutes from Interstate 85 or Highway 29. 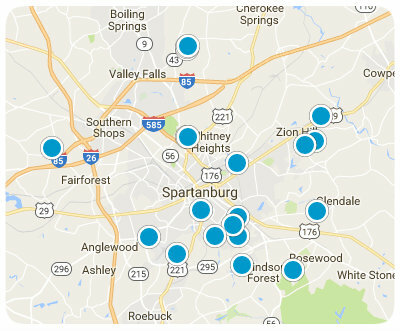 You will find this neighborhood convenient to either Spartanburg or Greenville full with all the activities that you enjoy doing. Shipwreck Cove is basically in your backyard and the perfect place to relax in the summer time. Come make Duncan and Bright Farms your home!